Today’s topic will be of special interest for all October babies! I am indeed going to tell you a little bit more about October’s birthstone: the opal. I am saying this, but to be fair opals could be of special interest to any gem lover because it definitely is one of the most mysterious and captivating gemstones ever. The word opal comes from the Latin “opalus” which itself is derived from the ancient Greek “opallios” that means “to see a change”. The very original etymology however is believed to be from the Sanskrit “upala” that means gemstone. This suggests that during Roman times opals potentially came from India. All these etymologies make perfect sense, opals are amazing gemstones because they don’t display a single colour, they display a multitude! Hence why ‘play of colour’ is an appropriate term to use when referring to opals. Opals can change colour depending on which angle you are look at them, what light you are viewing them in, and even dependent on weather conditions – how fascinating? Look at this beautiful example in our inventory: you can see that the feature gemstone is not just a plain white rock, it has so much more to it, so many colours! Bearing in mind that it is very VERY difficult to capture an opal’s true colours in any image, the stone in real life often proves to be even more polychromatic. I promise I am not the only lunatic who finds them so intriguing… (honest!) According to Australian Aborigine legends, the Creator came to earth on a rainbow to bring a message of peace to all humans; when his feet touched the ground it brought all the stones to life and they all started shining with all the colours of a rainbow: this is how opals were born! Opals are what can be called a “soft” stone. They indeed have a hardness of somewhere between 5.5 and 6.5 on the Mohs scale, which is almost comparable to pearls. Opals are hydrated amorphous forms of silica (I totally know what that means…) and their water value is quite important, ranging from 3% to 21% by weight. This means that opals may fracture with water loss. 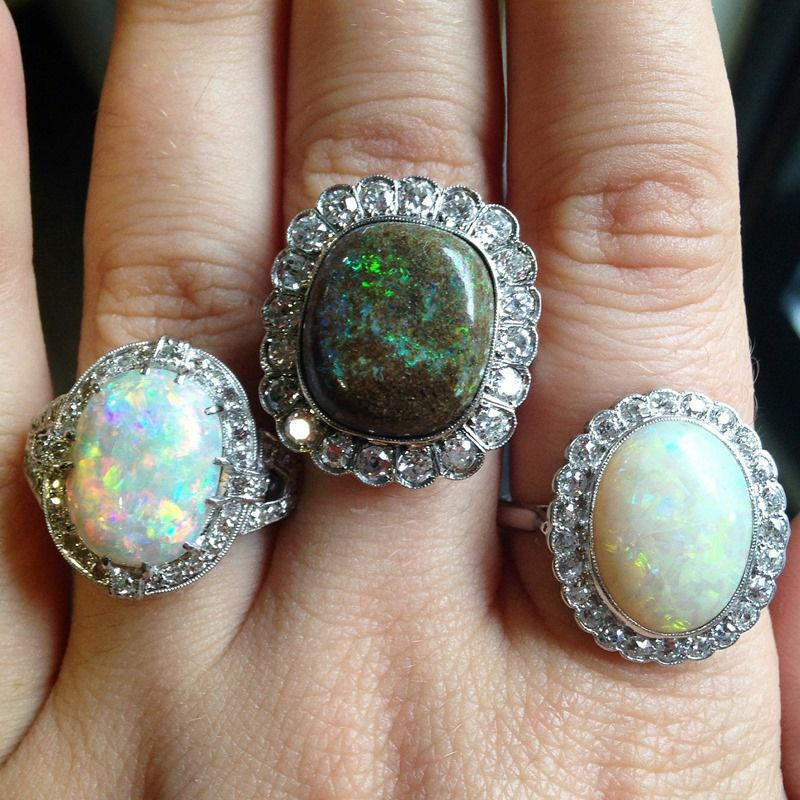 Excessive heat can also have a damaging effect on opals. Just like pearls, opals do not react well to chemicals, and that includes soap and perfume. Due to their relatively fragile nature, these gemstones need a little bit of extra care, but this should never detract from owning a piece of opal jewellery. When they are well looked after opals are wonderful gemstones that will never cease to amaze you. The excellent condition of our antique opal items is ‘living’ proof of how taking good care of a gemstone can make a significant difference. If such pieces, that are at least 100 years old, still look perfect, then opals can definitely age well in the right conditions. Opals can come in pretty much any colour, just like their “rainbow” legend suggests. There are a lot of different types of opals indeed, and depending on their colours opals may be more or less desirable and expensive. 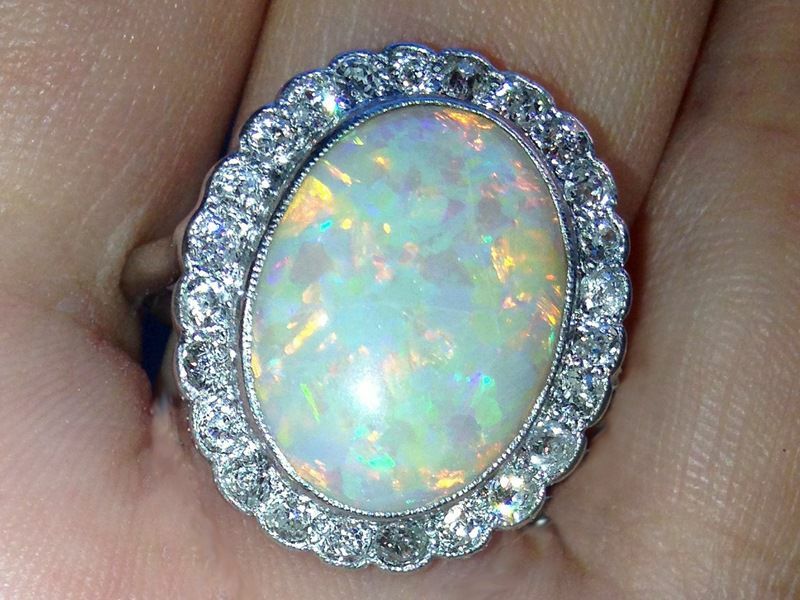 How to estimate the value of an opal? The value of opals is not defined or controlled by a dedicated governing body or authority. Just like any other thing, opals are subject to the vagaries of supply and demand. 2. 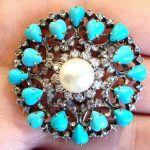 The pattern created by the play of colour: The bigger the patterns created by the colours, the more desirable opals become. One of the most sought after pattern is ‘Harlequin’. 3. The diffracted colours: Top down, the most desirable colours are red, orange, yellow, green, blue and purple. This is even more true when it comes to black opals. The most expensive opals are black opals that have a strong play of red. 4. The shape or cut of the stone: One of the most common cuts for opals is the cabochon cut – the less flat the opal is, the more sought after it is. 6. 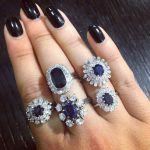 The layer thickness: Quite logically, the deeper the gemstone is, the more expensive the stone is going to be. Here are a few different opals from our inventory: a wonderful boulder opal and two white opals that have such great play of colour. Look at the Art Deco one on the left, it is absolutely amazing, definitely one of my favourite rings in our inventory! So, I know I’m repeating myself, but really every woman deserves a piece of opal jewellery – I realise I am a very bad (or good?) influence when it comes to buying jewellery… And even if you weren’t born in October, surely you must know someone that was, just use them as an excuse to justify your opal purchase (if you needed any!) 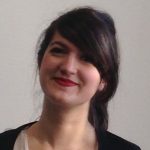 I promise that works, AND it will make that friend feel super special – win win situation! 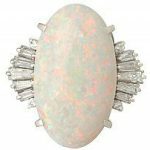 I will leave you on that note, dreaming about opals with the help of a link to our opal jewellery… Enjoy! 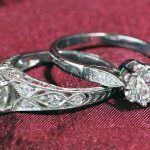 Previous Entry: Instagram … We Are Here! !